The x-ray absorption spectroscopy at the L-edge represents a unique tool to investigate the properties of highly correlated materials like transition metal (TM) oxides and organic compounds with TM centers. The underlying physical process is the photo-excitation of 2p electrons into unoccupied 3d levels. The latter are responsible for a variety of phenomena like spin ordering, Kondo resonances and superconductivity, of the uttermost relevance for possible applications. Moreover, when the L-edge absorption spectra are measured with circularly polarized x-rays, specific sum rules applied to the spectra provide a unique probe of the magnetic properties of ferromagnetic materials. The theoretical description of these electronic excitations still poses a big challenge for ab initio methods, and therefore novel computational approaches have to be developed. In fact, in addition to the intrinsic difficulty in describing the strong correlation of the d electrons, complex phenomena have necessarily to be accounted for, like the ligand field generated by the neighbouring atoms, the multiplet structure associated with the spin-orbit coupling in 2p and 3d shells as well as the final state with a 2p hole, all having a strong effect on the absorption spectra. We have developed a novel and efficient computational scheme for the calculation of the L2,3 edges x-ray absorption spectra (XAS) that combines Density Functional Theory (DFT) with Dynamical Mean Field theory1 (DMFT) and Multiplet Ligand Field Theory (MLFT)2. The scope is to integrate the advantages of the ab initio methods, like the parameter free electronic structure (albeit with a poor account of correlation effects), with those of the multiplet ligand field theory, which is designed to describe the many body interactions that affect a selected atom, but has to rely on a number of parameters to supply the information on the electronic structure of the systems. A similar approach had been previously proposed1, based on the construction of a compact tight-binding description of the DFT band structure by using projection onto Wannier functions, which we have not used in the present case. In the developed method, the impurity and bath states of the MLFT are constructed from ab-initio DFT calculations. At this point the initial state Hamiltonian is obtained by adding the correlation effects according to the Single-Impurity Anderson Model (SIAM)3 . The XAS Hamiltonian then is constructed by including the 2p to 3d excitations, i.e. by taking into consideration the core-hole. The transition probabilities are computed within the dipole approximation. 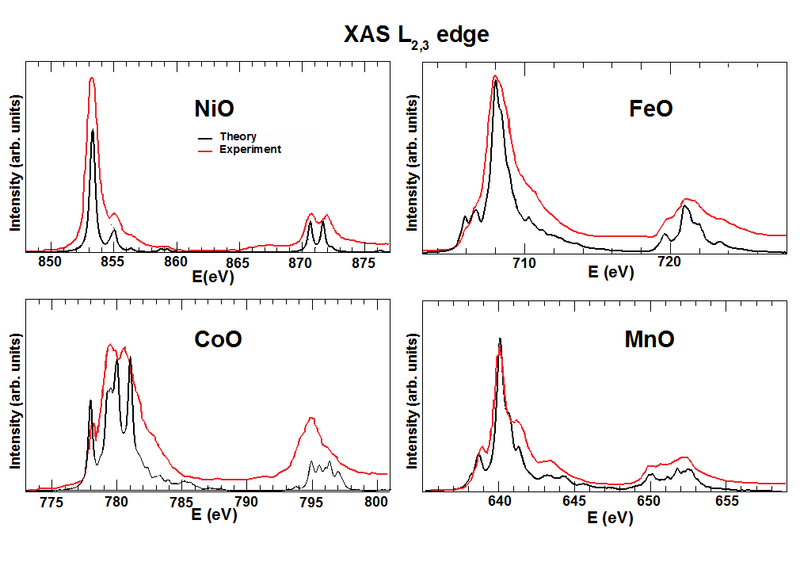 The implemented scheme has been applied to the calculations of L-edge spectra of a series of transition metal oxides, such as MnO, FeO, CoO, NiO, resulting in a very good agreement with the experimental data. G. Kotliar, S. Y. Savrasov, K. Haule, V. S. Oudovenko, O. Parcollet, and C. A. Marianetti, Rev. Mod. Phys. 78, 865, (2006). M. W. Haverkort, M. Zwierzycki, and O. K. Andersen, Phys. Rev. B 85, 165113 (2012). P. W. Anderson, Phys. Rev. 124, 41 (1961).